I probably underuse my Microwave, and every now and then I’m astounded by how well it works on some items – Poached Eggs in the Microwave are one of those. While I’ve poached eggs for years in simmering water, I have to admit that they always turn out better in the microwave. And it’s so easy! As soon as you get your timing down, you’ll be turning out perfectly poached eggs that look like they were cooked by a pro! And in the fraction of the time of stovetop poached eggs. Probably the biggest drawback to poached eggs in the microwave is that they have to be done one at a time. I’ve tried multiple eggs and it seems to be pretty much a crapshoot with some done before others and a lot of uneven cooking. The plus side is that they are very fast and really easy to do. Poached eggs in the microwave take about a minute per egg, so you can turn out several in less than the amount of time it takes to bring water up to a simmer and poach them the old-fashioned way unless you really need a lot of eggs. I’ve used Poached Eggs in the Microwave on this site in my Classic Eggs Benedict, Salmon Asparagus Hash, Eggs Florentine and my Grilled Asparagus and Quinoa Salad. (I overcooked the eggs on the last! Hey, it happens, even to food bloggers! lol!) All of these recipes are favorites for special occasion breakfasts or brunches, or when you just want to feel a little pampered. Of course, you can’t go wrong with the classic Poached Egg on Toast, especially if you’re a dipper! The method couldn’t be simpler. 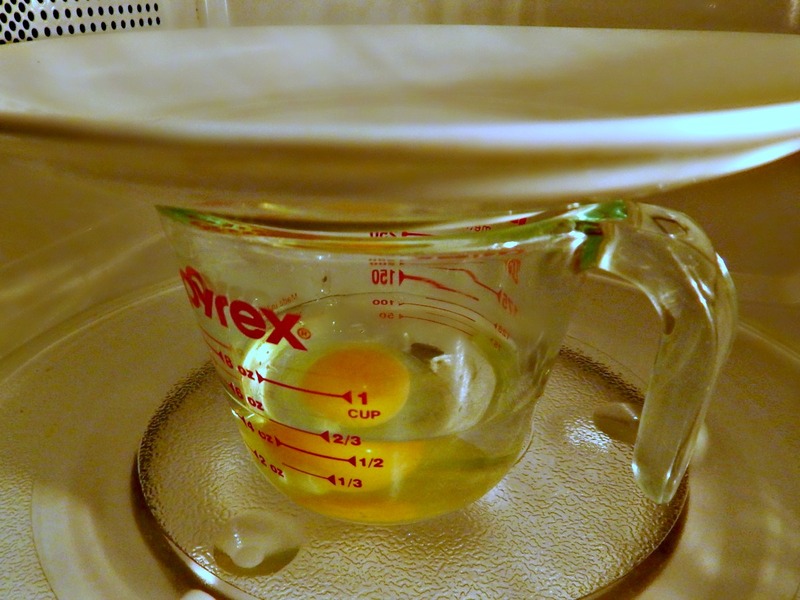 Add cold water to a Pyrex measuring cup, a teensy bit of vinegar and the egg. The vinegar helps the whites set up faster so the egg white will stay together a bit better. Then loosely cover the container. A small plate works well and microwave. It’s worth noting that there is no standardized setting for the power on microwaves and that can affect how fast or slow your egg cooks. I imagine the size of the microwave can be a bit of a factor, too. So you might just have to experiment to get your perfect timing. Eggs are cheap and I think it’s well worth it. Just recently, August 2018, I heard of a poached egg that exploded shortly after being removed from the microwave. It seems eggs can also explode in the microwave. While normally this doesn’t happen with eggs removed from the shell, do be very careful and keep your face away from the egg, just in case and beware of the possibility of a safety risk. Place water and vinegar in a microwave-safe container – preferably a Pyrex measuring cup, but a mug, glass or bowl work well, too, as long as the egg is covered with water. This may affect timing. Gently crack egg and add the egg to the container. Loosely cover with a saucer. Microwave on high for approximately 50 seconds to 1 1/2 minutes. Remove immediately with a slotted spoon as the egg will continue to cook if left in the water. To cook additional eggs, start with fresh water each time or the timing will be off because the water starts off hotter for each egg. To hold poached eggs, simply place them in warm water or on a damp plate. Note: I made a slight change in the timing and mentioned to use cold tap water, primarily because someone noted on Pinterest this didn’t work out for her. I’m hoping that this will solve the issue. Mine, in the Pyrex cup shown take 53 seconds. Raw or undercooked eggs may pose a safety risk. This entry was posted in Click here for Fabulous Food Posts and tagged Breakfast or Brunch Dish, Eggs, Microwave, Poached egg, Vinegar. Bookmark the permalink. Hi and thanks! It sure has made my life easier. It took a couple tries to get them just right. Thanks Bethannie! I can’t take credit for it, but I’m glad I could post it! Plus when I post things like this – I always know where I put the recipe!